Baccarat is one of the most popular casino games. It is mainly played in European casinos, especially in Germany and France, but the online baccarat version is often played all over the world. The game itself originates from Italy and at first this game was played with tarot cards. In 1490 the game began spreading all over the Europe. At first it found its admirers in French aristocratic houses and from that time is considered to be sophisticated and elegant game. With the establishment of French casinos it became available to common people. The growth of game popularity led to the appearance of new baccarat versions. The renewed baccarat version "chemin de fer" reached England and some other countries. 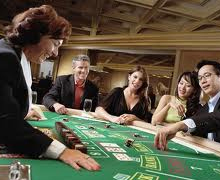 English players made some changes in a game and the modern variation of it is called "European Baccarat". Modern American baccarat version comes from Havana Cuba Capri Casino game. The popularity of the game reached also the Asian countries, where it became extremely popular and remains the same till now. There are two online baccarat variations: North American Baccarat and Punto Banco Baccarat. The main aim of these two variants is to get the amount of cards with total value of 9 or close, without exceeding it. It is played with a standard deck of 52 cards, which consists of 4 suits: the diamond, the heart, the spade and the clubs. 2s-9s - according to their value. At the start of the game, the dealer puts an initial baccarat bet, which is known as a "bank". It is dealt two cards each player and a banker. To find out more detailed baccarat rules, read our site. The layout and the side of a table.